Rare Clay Foundation Brick, Elamite, ca 1300 BC. This brick is rare and intact with 4 lines of Cuneiform going all the way over two sides. The description commemorates the ruler that laid this stone in an ancient Elamite city. Impressive piece - 40 cm. high, 9,5 cm. thick and 17 cm. wide. Very heavy in hardburnt clay. More than 10 kilograms, perhaps likely 12. Extremely rare huge Greek Crete bell krater!! An extremely rare greek bell krater, from Mykenos, Crete, dating to the 6th.-5th. Cent. BC. The krater is huge and heavy with thick walls. Finely decorated in red and black with very elaborate handles. An extremely rare piece and the first Cretan krater of this type we've ever had in stock. Size: Huge pottery vessel, measuring 33 cm. high and 31 cm. between the handles. Rare and large Egyptian pottery Net Jar - Naqada period! AN EGYPTIAN POTTERY NET JAR PREDYNASTIC PERIOD, LATE NAQADA III, CIRCA 3100-3000 B.C. The Jar very attractive and of an impressive size. It's decorated with darker line decoration in the form of a net on red terracotta. Waves in relief on the upperpart ca. 5 cm. from the rim. Condition: Choice!, small chip to the rim othervise intact and superb for type. China export portuguese porcelain plate Cheng Lung! Chinese Export Armorial Soup Plate Bearing a Coat of Arms, possibly for a Portuguese nobel family Earlier Chien Lung, c. 1740-60. A superb early dish or plate of an impressive size! Condition: Superb for type. No chips, dings or repairs whatsoever, but some imperfections from the making and slight wear to the decoration on the fan. 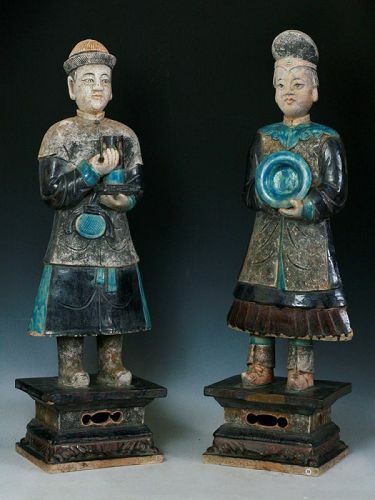 Museum Quality complete Tomb pottery banket scene, Ming Dynasty! 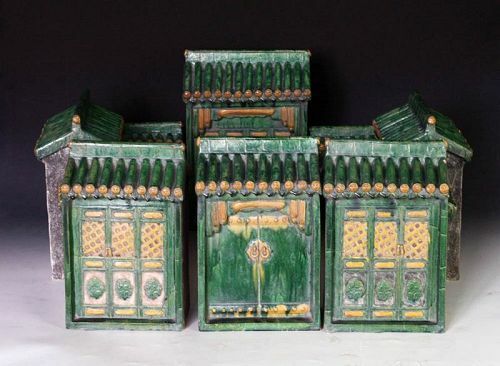 A fantastic set for a small banket, made as Tomb pottery in Sancai colours, Chinese, dating to the Ming Dynasty, 1368-1644 AD. The set consists of a massive table filled with 8 dishes with food, incl. a whole bird, a large Carpe fish, a pile of corn, fruits, loafs etc. (23,5 cm. long and 13,5 cm. wide). At the table to matching Horseshue chairs, very ornate and beautifully made (18-19 cm. tall). An extremely rare and interesting figural group of the Dying Buddha, Chinese Ming Dynasty (1368-1644) Tomb pottery, dating to the 15th.-16th. century AD. It's the 2nd. matching set that we have listed at Trocadero - this one in blue colours the other in green and orange. An extremely rare and absolutely stunning massive wall decoration of a Dragon, dating to the Ming Dynasty, 1368-1644 AD. It consists of 4 tiles, that when put together, form a fierce looking Dragon glaced in Sancai colours of orange-brown on a green base. Size: A huge piece with a diameter of ca. 60 cm., very thick tiles in high relief and combined, very heavy. Condition: Superb, nothing to remark, excellent for type and age. The item is from an old collection and comes with a COA and eternal guarantee for authenticity. 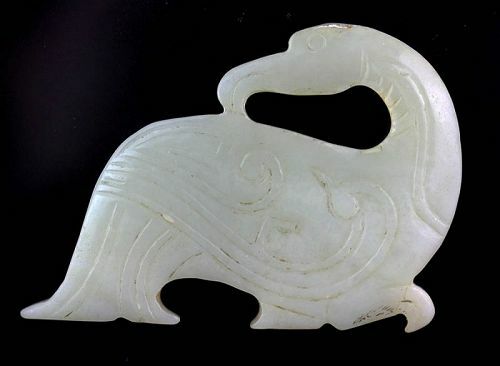 A fine pale or white-celadon Jade carving in the fine style with beautiful simple engravings of feathers on the flat surface. size: 73 mm x 47 mm. A large and very impressive tomb pottery horseman, Chinese, 1368-1644, this horse with complete Thermoluminescence test from lab, testing it as ca. 480 years old. A rare tomb pottery officer that we purchased as part of a small group recently. This figure has been TL tested as ca. 480 years old, see our listings at Trocadero for other Officers not TL tested and thus cheaper but guaranteed genuine. A rare tomb pottery officer that we purchased as part of a small group recently. This figure has been TL tested as ca. 500 years old, see our listings at Trocadero for other Mandarin Officers not TL tested and thus cheaper but guaranteed genuine. The horseman are among the 2nd. largest type of Tomb pottery horsemen on the market. A massive figure of a sculptural quality that is rarely seen from this period. The figure in green seated on a large horse bending it's neck, perhaps eating grass. This figure is one out of a very small group of these artful and expressive horsemen in similar style, that we have in stock, see our shop for more. This horseman is among the 2nd. 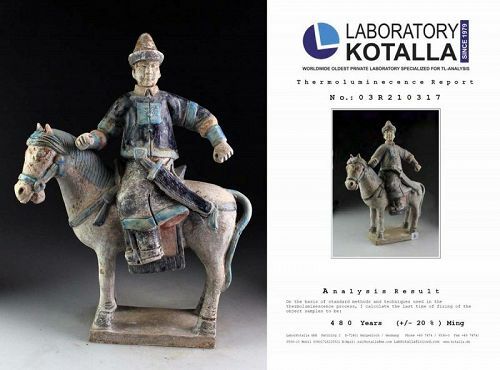 largest type of Tomb pottery horsemen we have seen on the market. A massive figure of a sculptural quality that is rarely seen from this period. The figure dressed in mail or harness in dark blue & torqouis colored glaze with nice openwork details. 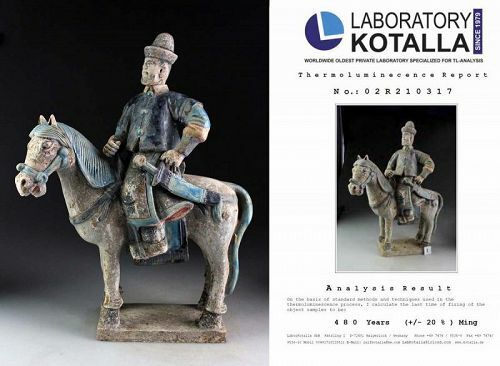 Superb Chinese Female pottery rider Ming Dynasty / w TL test! 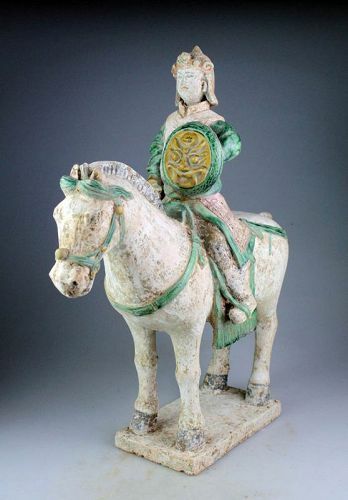 A very scarce and beautiful Chinese pottery tomb figure of a female rider / Attendant on horseback holding a Basket, Ming Dynasty, 1368-1644 AD. This figure is TL Tested (termoluminiscense) by Ralf Kotalla Laboratory as ca. 540 years old (see picture of the report). High quality large Pre-columbian Vicús / Moche vessel w TL test! A large and important Pre-columbian vessel with Cat form, Peru, Vicús Culture, comporary with early Moche 1st.-3rd. century AD. The vessel comes with a TL report from Kotalla Lab, (cost about $300).